Vascular differences aside, as grass-like plants, sedges and rushes are very useful additions to the garden at Barn House. They’re evergreen, come in a range of sizes and provide welcome splashes of colour under the shrubs which are coming into leaf. 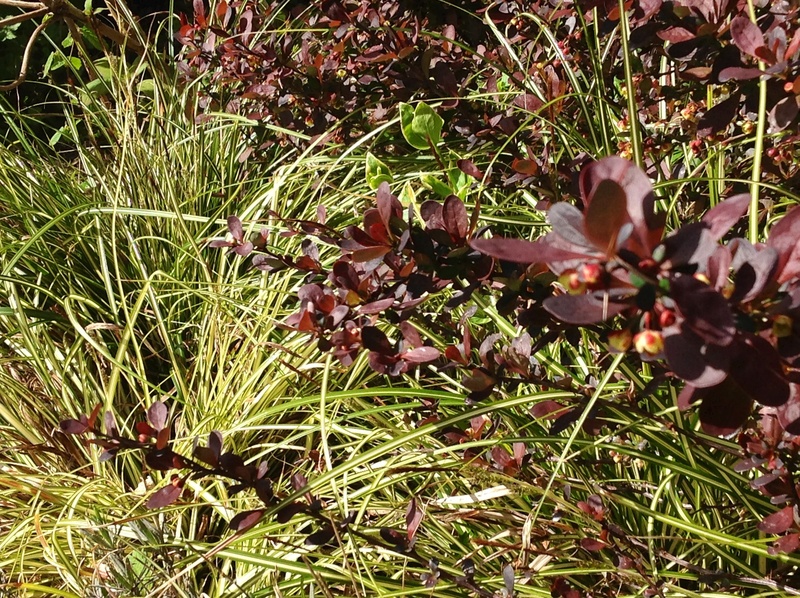 They are happy to grow in tricky sites, be that in deep shade or damp ground – low growing forms excel, particularly as ground cover in hard to reach, prickly spots. 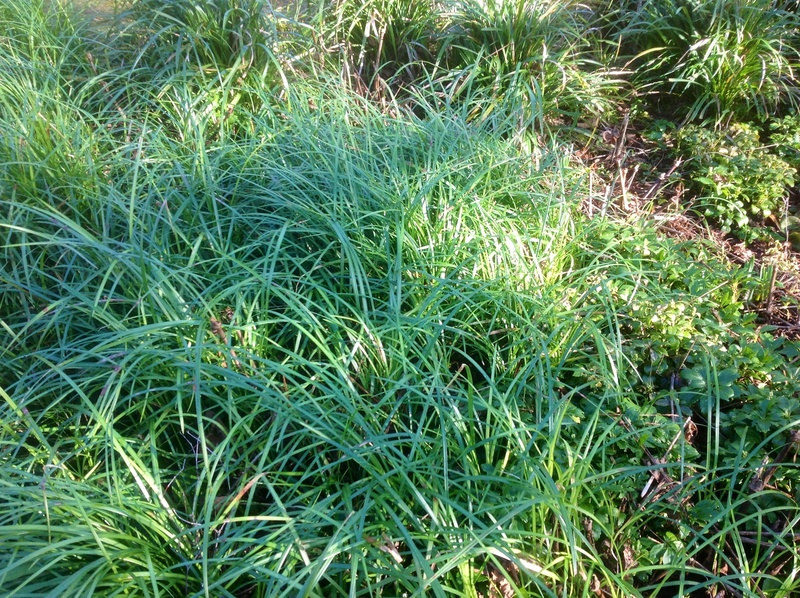 But, better still, rushes and sedges are virtually maintenance-free. They may be groomed, in early summer – but I leave them to their own devices, new growth quickly covers spent leaves. 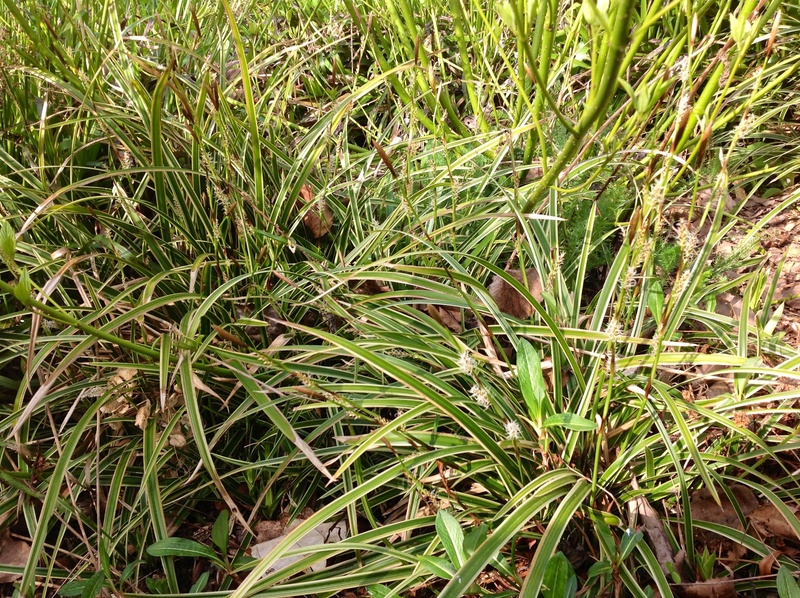 The upright leaves of another variegated sedge, Carex ‘Ice Dance’, planted at 5 plants a metre, compliments the yellow stems of Cornus sericea ‘Flaviramea’. This handsome carex is not in a hurry, it has taken three years to form good sized clumps, let alone fill the space allocated to it. Meanwhile, its neighbour Persicaria affinis ‘Donald Lowndes’ exuberantly fills the gaps. Ironically, I selected this low growing persicaria to weave among bronze forms of carex specifically because I liked the pink flowers of the persicaria against the glossy brown leaves. 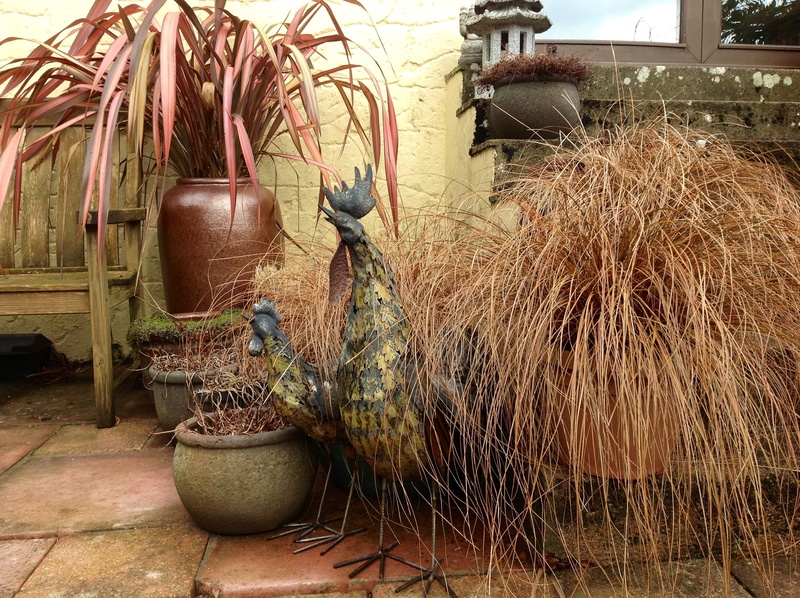 The carex didn’t do so well in the border and the survivors have since been potted up. This is the first garden I’ve had trouble growing them in the ground, elsewhere they have grown vigorously. This cultivar seems happier in a good sized container, at least for a year or two, and they self seed with some enthusiasm. The summer thicket of ‘the winter garden’ hides a carpet of hard wearing ground cover, the luzulas succeed where few plants could. 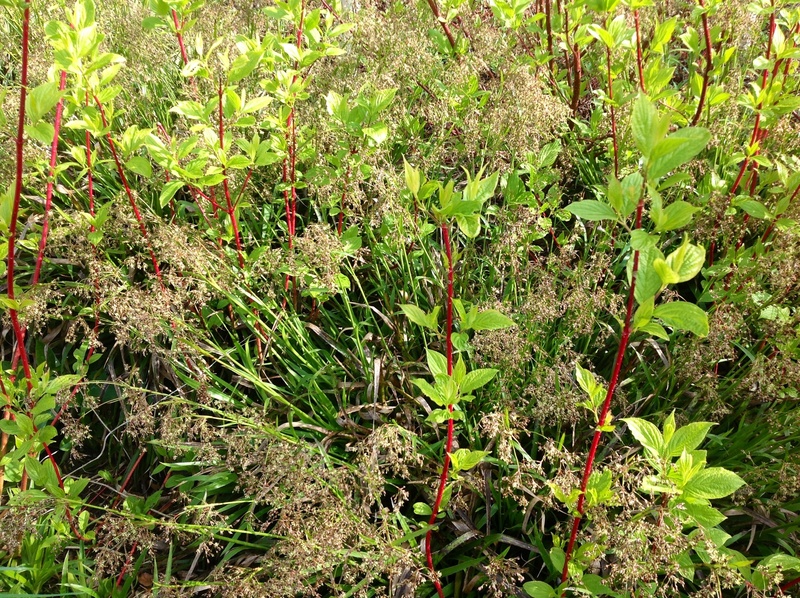 They suppress the worst of the weeds while surviving an annual trampling when the cornus is stooled. 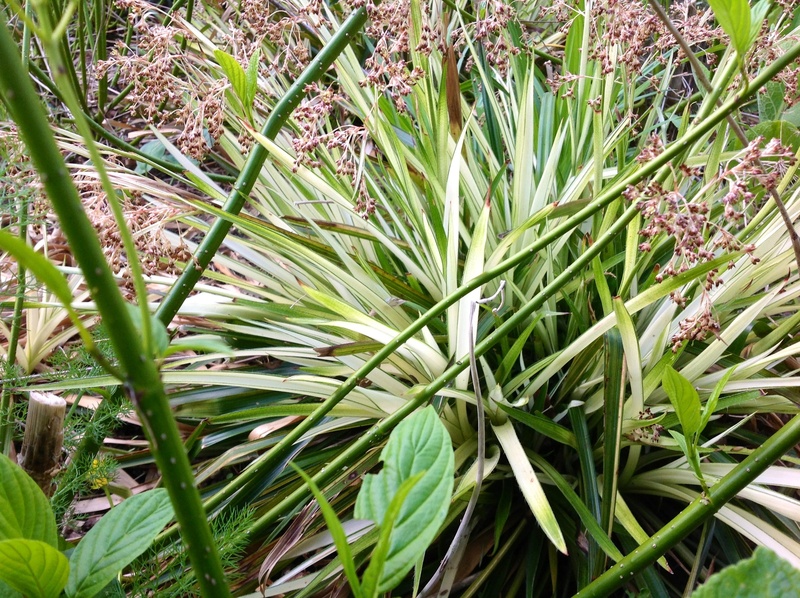 The most vigorous of the rushes is Luzula nivea, a self-seeder, that also spreads by stolons. The bright green’s a classic way to set off the lip-stick red Cornus alba ‘Sibirica’ (syn. Cornus alba ‘Westonbirt’), but I prefer the combination in April when the froth of luzula creamy flowers reach through the fresh cornus leaves. Luzuala nivea forms dense metre square mats in just one year. When I bought the plants it was late winter, and they looked promising sprawling out of a 2 litre pot. They easily pulled apart to make several new plants which have quickly filled their allocated space. One of these plants goes a long way. Luzula sylvatica ‘Aurea’ is a much more compact plant, so it’s been much slower to spread, even planting it at a higher density – at least at 3 plants per metre – it has taken a while to show as a ribbon of colour. Remaining golden yellow throughout the winter, it’s a bright contrast to the orange stems of Cornus sanguinea ‘Midwinter Fire’. In late winter Luzula sylvatica ‘Tagggarts Cream’, planted around the yellow Cornus sericea ‘Falviramea’, still has its plain green autumn foliage. In April new cream leaves replace them, along with the flush of flowers. It has a reputation for being harder to grow, it’s certainly the most demure of the three Luzulas I grow and seems most favoured by the voles. I see I have lost another one to them this winter, but on the other hand it has self sown and the emerging new leaves are a delight. Liriope spicata is a splendid grassy cheat, possibly my favourite for the way just several 2 litre pots have quickly filled a busy corner of dry shade. In this case, it’s the dogs cutting corners in the race to the paddock. Luckily, like them, this creeping turf lily is a loveable thug. Unlike them, it’s self-grooming. For most of the year I tend to overlook these undemanding plants. Come spring, I’m reminded how indispensable they are in helping me manage the borders. 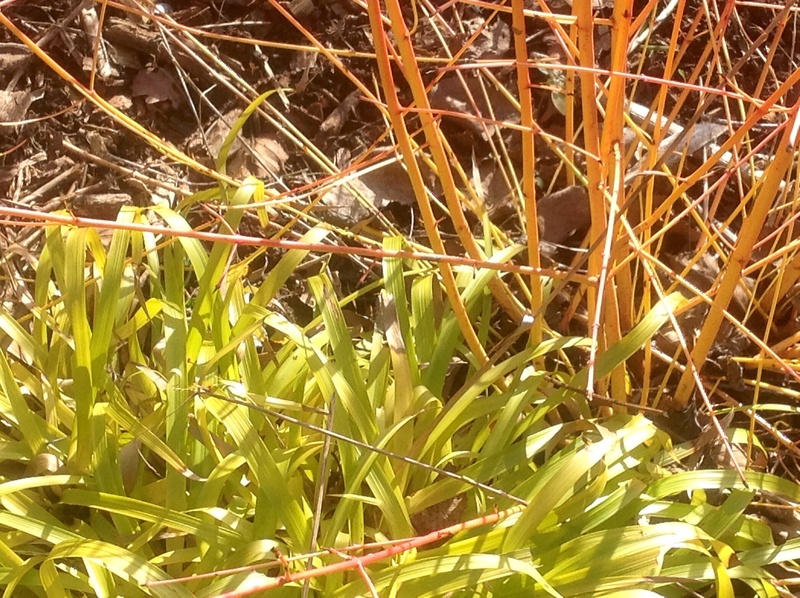 Perhaps groundcover is considered a dull necessity, only to be appreciated when, in its absence, the weeds take hold?